Infosys Shares Fall 15% In Two Days. Should You Buy Now? 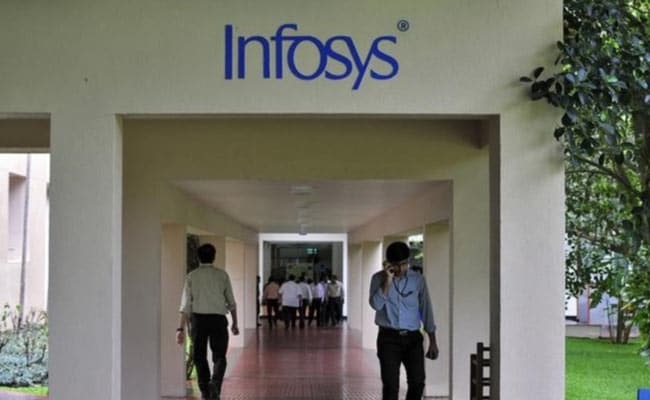 Today's fall in Infosys shares came despite the company announcing a Rs 13,000 crore share buyback on Saturday, at a price which is 25 per cent higher than Friday's closing price. Infosys shares extended its downward journey on Monday and fell as much as 5.75 per cent. In last two trading sessions including today, shares of India's No.2 IT services exporter has corrected nearly 15 per cent, wiping out nearly Rs 35,000 crore of investor's wealth. Today's fall in Infosys shares came despite the company announcing a Rs 13,000 crore share buyback on Saturday, at a price which is 25 per cent higher than Friday's closing price. Infosys said it will buy back nearly 11.30 crore shares at Rs 1,150 per share. 1) Some analysts believe the uncertainty hovering around the appointment of new CEO after Vishal Sikka's abrupt exit would likely to keep the stock under pressure in the near future. Nomura downgraded Infosys to "reduce", saying the uncertainty over Infosys' management could hamper long-term growth. 2) Market analyst Ambareesh Baliga said in a blog post said: "With lack of clarity on the next leadership, investors will be waiting with bated breath. Clients will prefer to wait on the sidelines and may slow fresh orders till a future plan of action emerges." 3) Vishal Sikka was reorienting Infosys towards new age technology service provider after he took over the reins of the IT outsourcer from SD Shibulal as CEO, three years ago. Infosys' revenue has increased by nearly 25 per cent during Dr Sikka's tenure. The reorientation of Infosys towards new age technology service provider may get affected after Dr Sikka's exit, say analysts. Sanjiv Bhasin, EVP-Markets & Corp Affairs at India Infoline, also shared the same view. He said the buyback is not likely to give a big boost to Infosys share prices. "Some foreign institutional investors may use the upside to sell the stock while domestic institutional investors may provide some support by buying at lower levels," he added. Mr Bhasin does not see much upside in the stock given the uncertainties surrounding the company after Vishal Sikka's exit. He suggests retail investors use the buyback opportunity to sell shares. 4) All initiatives driving Infosys' strategic execution - NIA, Zero Distance and Edge suite of solutions - were initiated and being driven by Dr Sikka, said domestic brokerage Motilal Oswal. "The key man risk, in our view, had been the highest at INFO (Infosys) among the top-tier IT," the brokerage said. Motilal Oswal is currently reviewing its rating on Infosys. "Near-term attractiveness may be higher, given the proposed buyback. However, beyond the event, the overhang of uncertainties and their possible consequences enlisted above limit confidence on the potential upside," the brokerage said. 5) HDFC securities said "Infosys' business transformation (focus on revenue productivity with automation and new offerings, incl AI) faces a real risk of derailment as the company gets into 'transition' mode. While better capital allocation (buyback) and the uptick in operations are positives, leadership transition and the risk of senior attrition can hinder growth". The brokerage has downgraded Infosys to "neutral" with a target price of Rs 995. 6) However, some analysts are optimistic that Infosys will be able to bounce-back soon. "While in near term it's (Dr Sikka's resignation) a setback for the company, but given the strength of the board of the company, we believe that the company will be overcome the setback," Sarabjit Kour Nangra, VP (Research- IT) at Angel Broking said. Infosys shares closed 5.37 per cent lower at Rs 873.50 apiece compared to Friday's closing price of Rs 923.10.